Since 1987 Hugglets has been bringing together teddy bear collectors and businesses through our specialist information services and events. It’s great to have you visit our website. We hope you’ll find what you’re looking for and come back often. 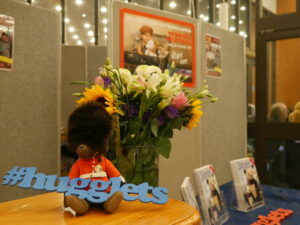 Here you can find out all about our HuggletsTeddy Bear Guide and Hugglets Teddy Festivals. We welcome your help to ensure this site is the very best we can make it so if you have ideas for improvements please get in touch. I flew in for the event from Northern Ireland. So worth it. Fantastic day and so much to see. We arrived just after 10.30am and hours later we were still there. We met some amazing artists and loved every minute of it. The range of bears, books, supplies and advice was endless. Pure heaven. I come from France and it’s always a great pleasure. 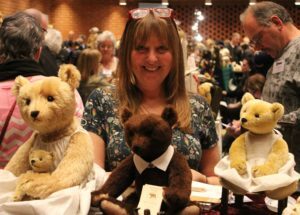 Our next event is the Hugglets TEDDIES Festival 2019 on Sunday 8th September in Kensington Town Hall, London, a remarkable extravaganza to celebrate 30 years of Hugglets Teddy Bear Festivals. 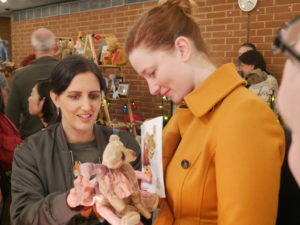 Over 170 exhibitors from around the world present teddy bear artistry at its best, antique bears and more. Please find all details for the event here.